If you’ve ever wanted to try amirugumis, this is the pattern for you! The pattern is to follow for those who don’t have much experience with crocheting amirugumis. There are even some photos to help explain some of the different steps. 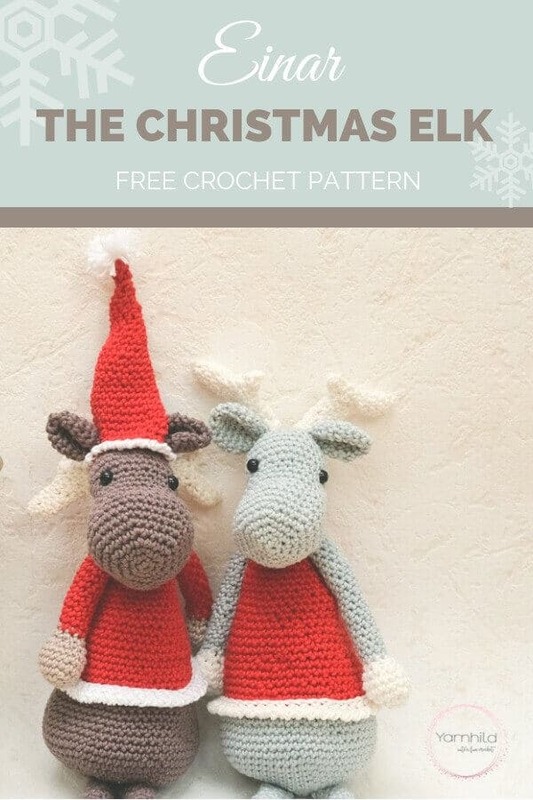 The elk is perfect for Christmas and you could make a handmade gift for someone you love! If you want to make one for your self, the Scandinavian inspired elk will bring some extra hygge to your home for Christmas! Purchase the premium pattern with even more photos and 3 language options on Etsy or Ravelry. Cotton yarn Schahenmayr: 4 colors. The elk is made in continuous rounds, remember to use a stitch marker. All parts, except the hat, are made with a 3.0 mm hook. Einar the elk measures about 45 cm from top to bottom, his feet inclusive. Don’t stuff too much, just so you don’t see the filling. Fasten safety eyes between round 15-16. Place the one eye where the 1 sc, 1 inc x 6 is. Leave 6 sc space between. Sl st in the first sc. Cut the yarn, leave the hole open. Leave a long tail for attaching the head. Sl st in the first sc. Cut the yarn, leave a long tail. Sl st in the first sc, cut the yarn, leave a long tail for fastening. Pick up five sc around the hole. won’t be so pointy. Do not stuff. Change to white and do 1 crab stitch in each sc (see video, below). Finish with a slip stitch in the first ch 1. Leave a long tail if you want to sew on the hat to the head. Do not turn your work as normal. Chain 1, insert the hook in the stitch to the right from your chain 1, yarn over and pull up a loop, yarn over and pull through two loops. It’s like a normal single crochet but it is being crocheted in reverse. Wind yarn around two fingers, about 25 times. Make a knot in the middle and cut the loops. Make a chain, (about 43 chains). Measure if it fits around the belly. You might need more or fewer chains depending on if you are a loose or tight crocheter. 1 sc in each chain, then do 1 crab stitch in each sc. Do not weave in the ends. I recommend that you use needles to figure out where the best positions are for the parts before attaching them completely. Put a pipe cleaner in the hole of the body for more stabilization for the head. Sew on ears on rounds 3-4. Leave 4 sc space between the ears. Sew on legs on round 3-4 on the body. Sew on the pompom on the hat. The gaps are for the ears, so put the ears in the gaps and put it on Einar’s head. Put the belt around his belly, you can just fasten it with a little knot from the strands or use the strands to sew fast the belt to his belly. I know you’re going to love making Einar the Elk and I so look forward to seeing your finished product. Meet Ragnhild, she is the blogger behind Yarnhild.com. This lady is a yarn addict who loves to make cute amigurumis and ragdolls. She discovered crocheting when she was pregnant with her child and started to learn from YouTube videos and crochet blogs. She aims to create beginner-friendly crochet patterns that are quick and fun to make. Her patterns often have many step-by-step photos and she also likes to make video tutorials. Look out for her designs in multiple languages a well, because in addition to English, she offers some of her patterns in German and Norwegian. Being born and raised in Norway, her Scandinavian heritage is reflected in some of her designs and she likes to give her animals traditional Scandinavian names.